The 2018 SXSW EDU Learn by Design entry deadline has been extended through Sunday, November 5 at 11:59pm PT. The Learn by Design competition elevates groundbreaking work of educators and designers in the pursuit of design-based solutions to challenges within education. The competition is open to projects and design solutions that enhance physical learning environments for students at every age. All educators, designers, community organizers and innovators working to transform learning are encouraged to apply. Selected applicants will present their work in a fast-paced pitch competition during SXSW EDU, March 5-8, 2018. Higher Ed: Universities, colleges, community colleges, professional learning centers, etc. PreK-12: Early learning, elementary and secondary schools, learning centers, etc. Informal Learning: Museums, libraries, community centers, etc. Conceptual: Projects that do not yet exist in a physical form. Learn by Design is about impact – We are looking for forward-thinking and inspiring projects that impact the learning experience and student outcomes. Learn by Design is about sharing – The Learn by Design competition is platform to share the story and purpose of your work. Anyone can apply – All four categories of the competition are open to anyone including students, who are welcome and encouraged to apply. Take your time on the application – Once you begin the application you’ll have the ability to save your work until you are ready to submit the form. Just make sure to submit before the final deadline, Sunday, November 5. Early registrants benefit from discount savings and the best SXSW EDU rates and hotel locations – register to attend and book your hotel before Friday, November 17 to save $150 on the walk-up rate. Or, save big and add a SXSW EDU badge to your SXSW Platinum, Interactive, Film or Music badge purchase for only $295. Once registered, book your hotel through SXSW Housing & Travel for the best available rates. 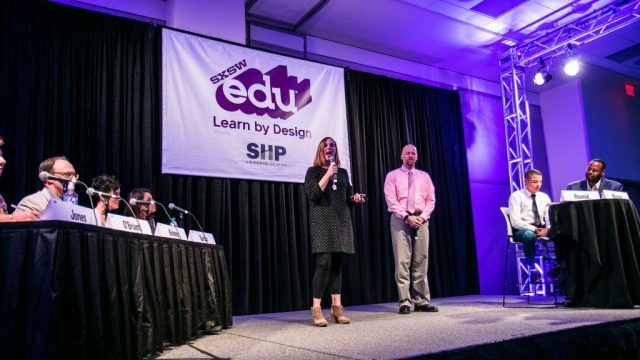 SXSW EDU 2017 Learn by Design competition. Photo by Steven Snow.